Bernie Goldbach in Cashel | Headline in Irish Independent. OPEN COMMUNICATION CHANNELS between parents and children start early but need nurturing. Effective channels can offset cyberbullying. When young school students can tell trusted adults that someone was mean to them, the effects of cyberbullying are minimized. 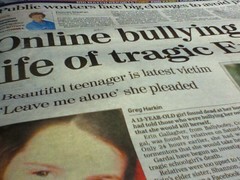 Several front page stories in Ireland reveal the pressures young girls felt online before they took their lives. As investigators combed through postings on Facebook and Ask.fm, a pattern emerges of young people facing an onslaught of hurtful comments without the comfort or support of family or friends. I hope our kids never feel they have to absorb body blows in the form of vitriol, derogatory remarks, photoshopped caricatures or snide comments from people they will never meet. I want to hear about the mean girls before they get elevated powers as cyberbullies. This is an essential topic in social media, particularly in Ireland where snarky attitudes are often the default mode of communications. I'M LEARNING A LOT about the intersection of cyberculture and creativity while attending the online Digital Lunch series arranged by Mick Fealty. The current series runs on Tuesday and Thursday afternoons at 1pm in Ireland. Today's conversation centred on risk taking--how to make innovation less risky for entrepreneurs and how to encourage risk. These are loaded questions that cut to the heart of social innovation. Bernie Goldbach in Cashel | Image from a podcasting session. I REMEMBER PODCASTING from 2004 and eight years later I feel like I've reconnected to the same intimate energy that propelled those early adopters as they shared ideas and music. This time, the tribal energy is coming from Audioboo, not the Daily Source Code. I've been a lurker on Audioboo for several years but this is the first month that I've contributed consistently to a collective effort that achieved a result. The project is called #octaver and it involves answering a different question about music every day in the month of October. I believe I will have 31 answers by the end of this week and that's worthy of a badge of honour. 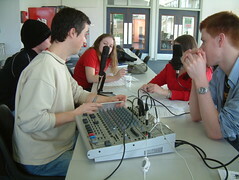 Actually, the continuity has created a connection between a loose band of Audioboosters who share ideas openly and courteously. 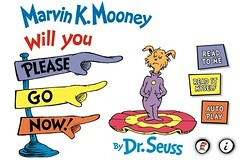 The demeanour often contrasts with attitudes I've felt on other social networks. The big difference on Audioboo is that the community is smaller, making it less likely to encounter snide comments and grandstanding. I like the communal buzz of Audioboo and hope I can connect it to my extended family a continent away like I suggest in the audio clip above. Bernie Goldbach likes user-generated podcasts. I WONDER IF there's any value to connecting Audioboo to Dropbox in a fashion similar to how Scriptogram works. I've connected Scriptogram to my Dropbox. This means I can produce a blog post in Scriptogram just by putting a text file into a designated Dropbox folder. I have to follow a specific format when uploading the markdown text but when I do, the results resemble the functionality I had with Radio Userland. If I could publish through Dropbox, I could produce MP3 files as Audioboos in different audio editors on any mobile phone then simply save them into my Dropbox folder for uploading to Audioboo. This kind of functionality could easily extend the different ways people could create and share Audioboos. Bernie Goldbach saves content related to Audioboo. Bernie Goldbach in Cashel | Memoto on Kickstarter. 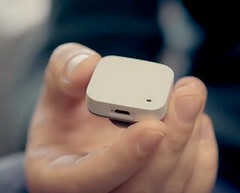 I DON'T WANT TO start lifelogging with Memoto's clip-on camera. It's available as a clothing accessory after its Kickstarter campaign finishes. The wearable camera is a plastic square with rounded corners measuring less than 1.5 square inches. It has a pinhole for its camera lens. Small clips on the back help attach it to collars, shirts, or straps. It snaps two 5 MP images every minute and embeds geodata into the EXIF file of every image. Its charge lasts for 48 duty hours. When you hook the Memoto to a computer to charge, it uploads its cache to the cloud where you can view the images. According to the designers, "the camera and the app work together to give you pictures of every single moment of your life, complete with information on when you took it and where you were." It's sentient and active--which can unnerve some people. I expect to see a few of these lifelogging cameras on people after this Christmas. I don't think it's good form to expose the pinhole to friends partying in pubs. Kickstarter -- "Memoto Lifelogging Camera" has $270,000 of its $50,000 goal. Bernie Goldbach has saved this technology in his stack of privacy pages. Bernie Goldbach in LSAD-Clonmel | Photo at O Tuamas. 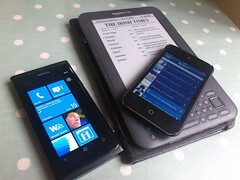 I SPEND MY MOST efficient moments engrossed in a flow between three screens--Lumia, Kindle and iTouch. I read most of my news on the Lumia via Wonder Reader and App App pointers. Those two apps run faster and deliver less noise than any other in my pocket. I send some important content and all of my long form reads to my Kindle where I often mark it up for syndication into my third level modules. 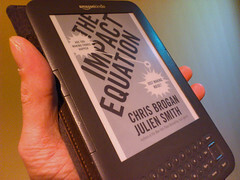 There is a whole process worth considering in the management of Kindle clippings. My iTouch has become my publishing tool when mobile. I use the Typepad app to create posts like the one you're reading. It's also my favourite way of recording Audioboos and reading iBooks. When I started online journaling in 1997, I never imagined creating and sharing from touchscreens without proper physical keys. In another 15 years, I expect to share to multiple places by VoiceOver commands integrated to the publishing app. That will easily quadruple the content on my blog. Bernie Goldbach saves references to changes in our digital lifestyle. Bernie Goldbach in Cashel | Mia in specs. 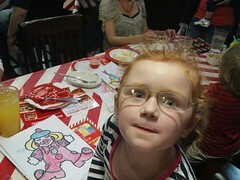 I REALLY HOPE our creative five year old (in the photo) continues developing her skills in social journalism. She's a real storyteller who deserves a channel to an audience. I might help a local primary school develop such a channel next month but I'd like the project to be measured by the outflow of content that it sends to the touchscreen newsfeeds of parents, teachers and relatives. Our kitchen table and sitting room floor is filled with clever and playful content that would bring smiles to Mia's grandmothers. When that content is viewed as part of a larger aggregate, it becomes a megaphone for joy. I want to enable young primary school students, some who cannot read, to share observations about their world. And I want their friends, some living eight time zones away, to respond to those observations in social channels. I want to empower young students to record and share short video clips that capture discovery and creativity. And I want teachers on other continents to sit up and notice the energy I've seen with the young and Irish in my life. I'm starting some of the adventure in an educasting channel. You're welcome to listen or to subscribe at http://audioboo.fm/channels/642468.rss and learn how we used the Xoom to snap Mia in action.